SGHS freshman Jessie Rutt (11) dribbles the ball against a Symmes Valley defender during Tuesday night’s 54-45 setback to the Lady Vikings in Mercerville, Ohio. 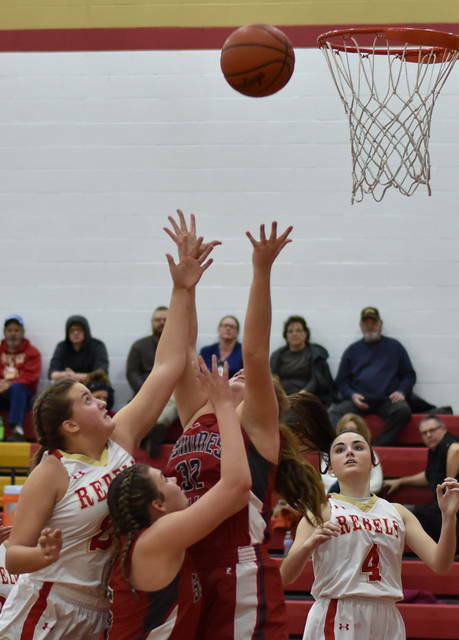 MERCERVILLE, Ohio — A slow start stifled the Lady Rebels. 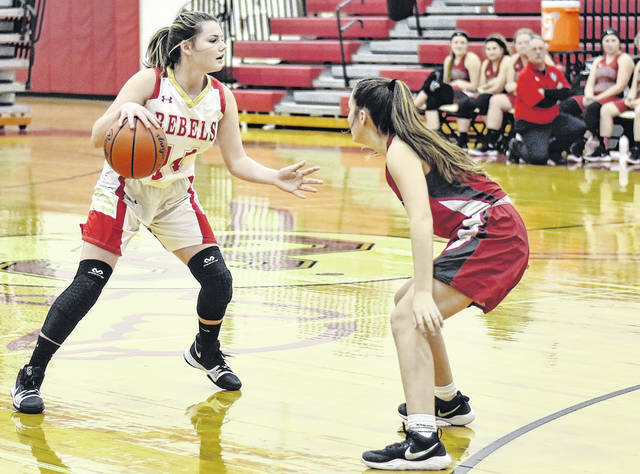 The South Gallia girls basketball team experienced early shooting woes in the first quarter, going just 1-of-18 from the field, as visiting Symmes Valley utilized the momentum of a 15-3 opening period to claim a 54-45 victory in a non-conference contest in Gallia County. The Lady Rebels (0-2) were held to a single free throw through 6:02 of the first period, before SGHS junior Alyssa Cremeens ended the scoring drought to cut the deficit to 9-3. The Lady Vikings, however, closed the quarter on a 6-0 scoring run to carry a 15-3 advantage into the second period. The Red and Gold began the second period with a 7-0 scoring run to close the gap to just five points, at 15-10. Symmes Valley, however, utilized a 12-7 run to widen its margin to 27-17 entering the intermission. The third period was tightly contested, with both squads scored 13 points each, as the Lady Vikings carried a 40-30 lead into the finale. SGHS struggled to hit their mark again in the fourth, as they shot just 3-of-22 from the field, while the visitors managed to make just 3-of-13 shot attempts. The Lady Rebels, however, outscored the SVHS 15-14 in the finale, en route to a nine-point setback. The two squads combined for over 100 rebounds in the contest, as South Gallia dominated SVHS in total rebounds by a margin of 64-40. The Lady Rebels finished with 13-of-74 (17.5 percent) shooting performance from the field, including 3-of-17 (17.6 percent) from three-point range. In contrast, the Lady Vikings shot 18-of-72 (25 percent) overall, including 3-of-22 (13.6 percent) from long distance. From the free throw line, Symmes Valley was 12-of-24 (50 percent), while the hosts were 14-of-29 (48 percent). South Gallia committed 30 turnovers in the setback, six more than the visitors. SVHS junior Rachel Hayes led the visitors with 23 points, including a 10-of-12 performance from the charity stripe. Taylor Sells was next for the Lady Vikings with 12 markers, including two trifectas. Emily Johnson added eight points, while Jenna Malone followed with five markers. Hailee Littlejohn and Kylie Deer each provided two points apiece, while Payton Hunter concluded the scoring totals for Symmes Valley with one point. Jessie Rutt led the Lady Rebels with 18 points, including one trifecta and a 7-of-15 performance from the charity stripe. Kylie Stapleton was next with 10 points, including two three-pointers. Amaya Howell followed with eight markers, including a 4-of-8 performance from the free throw line, while Christine Griffith was net with five points. Rounding out the scoring totals for South Gallia were Alyssa Cremeens and Makayla Waugh who each finished with two points apiece, respectively. The Lady Rebels return to action on Thursday, as they host TVC Hocking foe Belpre.